The Food Bank: Volunteers sort and shelve donated food and ready food distributions for area brown bag programs, survival centers and senior center food pantries. Shifts are 4 hours weekly. Standing and some lifting is required. Brown Bag Programs: Volunteers pack and deliver donated food once a month to low income seniors. 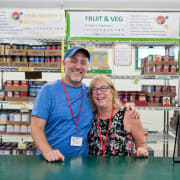 Survival Centers & Food Pantries: Volunteers accept donated food, sort and shelve donations, and help low income clients choose food items. Drivers are also needed to pick up donated food either in their own car or in the Center van. Shifts are weekly for 4 hours and require some lifting and standing. Senior Center on-site Food Pantries: Volunteers accept and shelve donated items. Volunteer drivers may pick up donations at local stores or the Food Bank. Meals on Wheels volunteers either pack or deliver the hot noon meals for hundreds of homebound seniors in the Pioneer Valley. MOW volunteers also conduct a short well-being check to frail elders on their route. A vehicle, insurance, good driving record and CORI are required. Contact Pat at psicard@hcg-ma.org or 413-387-4558 x1 for information about opportunities in Hampshire & Franklin Counties. Contact Ginger at gelliott@hcg-ma.org or 413-387-4558 x5 for information about opportunities in Hampden County. Good customer service skills and sensitivity when helping low income clients.